Mr. Maher Nasser has over 29 years of work experience in the United Nations System during which he has worked in various capacities in Gaza, Jerusalem, Amman, Cairo, Vienna and New York. Mr. Nasser became Director of DPI’s Outreach Division in February 2011. 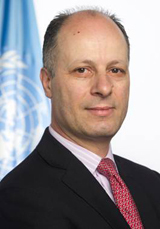 From April to mid-August 2012 and from August 2014 to February 2015, Mr. Nasser was Acting Head of the United Nations Department of Public Information. Mr. Nasser first joined DPI in January 2006 as Director of the UN Information Centre in Cairo. Before joining DPI, Mr. Nasser worked in various positions with the UN Relief and Works Agency for Palestine Refugees in the Near East (UNRWA) in Gaza, Jerusalem, Vienna, Amman and New York and with the UNODC in Vienna. After graduating as a civil engineer from Bir Zeit University near Ramallah in 1986, Mr. Nasser worked with two Jerusalem-based NGOs focusing on development and human rights. Mr. Nasser also attended the Middle East Peace Conference in Madrid in October 1991 and the subsequent bilateral negotiations in Washington DC as the personal assistant to Dr. Haidar Abdul Shafi, the Head of the Palestinian Negotiating Team.